Albert J. Sanders, Jr. still remembers the excitement he felt on Christmas day. He recalls that it was about 1985. Sanders was only in second or third grade at that time, when he unwrapped the greatest gift ever – a Voltron, Defender of the Universe toy. 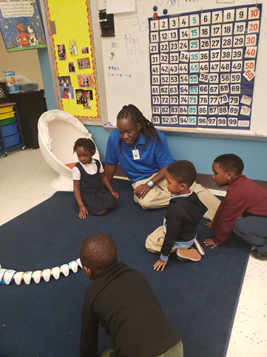 Sanders has been a pre-K teacher at Adams Elementary School in St. Louis for the last 14 years. He’s not defending the universe, but he does believe that teaching is the greatest and most noble profession on Earth. 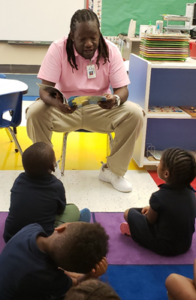 “I say greatest profession because, in partnership with parents, teachers are the best positioned to equip young people with the knowledge, skills and behaviors to unlock all other opportunities in their lives, both professionally and socially,” he said. In 2018, Sanders was named a Missouri Regional Teacher of the Year. This award is part of the Missouri Teacher of the Year program, sponsored by the Department of Elementary and Secondary Education (DESE), which recognizes the efforts of effective teachers in providing a quality education for their students. Preparing, developing and supporting effective educators is one of DESE’s primary goals. Sanders was always a good student and enjoyed being in school. Second grade was probably his favorite year because of his teacher. Sanders remembers that she was always understanding and encouraging. The teacher’s understanding nature was one of the reasons he decided to become a teacher himself. Sanders said that he tries to be like her with his students, who are enthusiastic and eager to learn. Sometimes, they’re a little too excited, much like he was as a second grader. As it turns out, Sanders is a lot like Voltron. Teachers are role models who inspire and encourage. They’re understanding, and the best of them play several parts that all come together — like those five lions — to form a child’s whole future.